Albania has made me afraid of the dark. It probably wasn’t that hard since I have always been one of those kids who long-jumps from the light-switch by the door to the bed at night in order to avoid the monsters that mysteriously appear at nightfall. But still. It’s worth noting for those of you who are considering moving to Albania in the near future. Kujdes. There’s something about this place that makes nighttime a forbidden hour in more ways than one. I think it first occurred to me when I was traveling in Bulgaria and Macedonia awhile back and we were driving down the road as the sun was setting. Every fiber of my being was telling me to go home. The voice in my head was saying, you shouldn’t be out here. It was such a strange feeling that I couldn’t help but laugh at myself. Danielle, it’s 6pm and in the US you’d just be getting home from work; relax. And then I realized that it’s something I’ve done almost since I moved to Shkoder- when the sun goes down, I go home. Now why is that? This is one of those realizations about Albania that has come to me over time. It’s not an blatant difference and it’s not abrasive enough to bother me or get in the way of my day to day life in an obvious way. But slowly over time I’ve come to realize just how much sunlight determines life in Albania. Men, women, young, old, city-dwellers and villagers alike. For example, I have this theory that the furgon drivers of Albania turn into pumpkins at dusk like in Cinderella. It’s the only logical explanation I can come up with. You see, the only possible time to travel around here is from sun up to sun down. Why? Why?! Maybe I want to have a drink with a friend out of town and then head home. Nope, not possible. You have to spend the night and try again tomorrow morning. Not entirely sure but it’s the truth. You see, in the summer you can catch a ride home all the way until like 7pm, but in the winter good luck finding something after 3pm. It’s not an official schedule (wouldn’t that be a novel idea?! ), but more like a general rule. Traveling here is all a game of chance. And it’s not like anything has changed from July to November besides the temperature, so why the different seasonal schedules? This Cinderella rule also applies particularly to women. In Albania, it’s very rare to find women out on the streets after sunset. There are of course exceptions, like the capital city, summer time, liberal families, etc. But in general, we pretty much go home as soon as the sun goes down. Even though I’ve walked the streets at night many times (no, not like thaaaat, you know what I mean) and had nothing bad happen to me. Albania is not a dangerous place unless you put yourself in a dangerous situation. I’d say the same for most countries and cities out there. I’m a firm believe that in general bad things happen to bad people. So why is everyone in Albania afraid of the dark?! And the end result of all this- after 2 years of living in Albania this subliminal messaging of “dark=home” and “night=scary” has finally sunk in. 8-year-old Danielle is back and I’m afraid of the dark. Cultural assimilation at it’s finest. If anyone invites me out for a coffee or dinner after dark and I’m not already out, the odds are I’ll make a weird excuse not to go. For absolutely no reason! But somewhere in the pit of my stomach, I’m afraid to walk down my street and I have no desire to leave my house when it’s dark outside. Maybe I’ve imagine the whole thing, but maybe not. Either way, just one more way in which living in Albania has completely altered my perception of reality and made me appreciate the little things in life. Like street lights. Since yesterday was Martin Luther King, Jr. Day I decided to tackle an issue that has long been bothering me as a PCV in Albania- racism. For almost 2 years I’ve turned a blind eye when my students say out-and-out racist remarks for the sake “community integration” and “intentional relationship building” (key words for any PCV out there). But now that I’m in the home stretch of my service I figured, why not? In the US I’m lucky to come from a part of the country (yeah Washington, D.C.!!) where in-your-face-racism is at a minimum and everyone is overly politically correct with everything to that point that it’s almost obnoxious. So needless to say it was rare to encounter people who threw around racist or sexist remarks without getting ostracized by the community (whether they had those beliefs and just kept them to themselves is another story though). As you can imagine, when I came to Albania I was little taken aback by some of the blatantly racist remarks coming from seemingly educated people. That’s not to say the entire population feels this way, but after 50 years of being cut-off from the world and having almost no immigration to this day, ethnic diversity in Albania is almost non-existent. There just aren’t enough black people walking around to make tackling racism an important issue for most of them. So I created a simple lesson plan where we talk about the Civil Rights Movement in the USA, MLK’s brief biography, and the current state of racism in the world. And much to my surprise, everyone seemed to be right on par with me. Up until that moment in every class, I was loving it and mentally patting myself on the back at a job well done, broaching a subject never discussed and having positive results. And then it happened, like clockwork, in the last 5 minutes of class everything fell apart. In almost every class. Every time. At the end of the activity I asked each class, “So does racism exist in Albania?” Without fail, in each class there was that one jerk in the back of class who shouted something about n—ers, smiled proudly, and proclaimed that racism isn’t an issue in this country because “we don’t have any black people.” It gets me every time. I try to keep my cool and explain how that doesn’t actually make any sense and that there are racist people all over the world regardless of the ethnic makeup of their population. Meanwhile the rest of the class breaks out laughing and high-fiving said jerk, and then the bell rings and I feel defeated. Halfway successful? I apologize for my over-dramatization but it was a big moment for me, so listen up. One amazing teacher who I work with saw my face and heard the comments coming from the back of the class, and she just let loose. For the last 10 minutes of class she shamed them into realizing their own ignorance at the issue of racism and how they need to learn respect and act their age and use this opportunity not just to learn English from a native speaker but improve themselves as human beings and prove that Albania is just as good as any other country and not full of prejudice, backwards individuals. Inside I was jumping up and down and screaming “yea! you go girl!” But on the outside I stuck to my tough exterior and thanked her for her support. Can’t show weakness in a classroom like that or you’ll get eaten for lunch. So then I turned to the class and said “In honor of MLK I challenge you to stand up against the racist comments you hear from your friends and classmates this week. It’s not funny, so don’t laugh. Use your words like he did and try to change their minds, because that is the only way we will ever improve our society.” And like magic the bell rang right then and we picked up our bags, held our heads high and walked out of the classroom. I’ve never been so appreciative of a fellow Albanian teacher in my whole life. Usually they just turn their backs as well and try not to stir the pot by correcting prejudice and racism. Albania is a tough place because of how important connections are. No one wants to offend someone else (or inadvertently call them a racist) because you never know who their parents are. But this teacher wasn’t afraid. And her mentality was miles ahead of the rest. She was right there with me the whole time. I have no idea if those kids got the message I was trying to tell them. I have no idea if they’ll actually change their opinions or rise to the challenge. But at least I know that one more person in Albania is standing up against racism and won’t back down in the face of adversity. It’s people like her that make me feel like I’ll be leaving this country in good hands when I return to the US at the end of my service. Happy Martin Luther King, Jr. Day to you all and I hope you inspire change in the hearts and minds of racists everywhere, whether they know it or not. I ask this question to my students as often as I can. Albania is chalk full of talented individuals with no sense of personal drive, and the American go-getter spirit in me just can’t stand it. I’ve spent countless days and nights asking myself why my students are afraid to pursue their dreams (or have any dreams at all for that matter). Why are they afraid to take a risk and do something different? Why are they afraid to break the status quo and make a change in this country that so desperately needs it? The US has one of the highest rates of innovation in the world (despite our terrible education standards), so I feel lucky to have grown up in an environment that continuously challenged me. In the US we are taught from a young age that “you can be anything you want to be if you set your mind to it.” I never realized just how lucky I was to hear that phrase every day and how much it actually shaped who I am today. A few weeks ago I met an Albanian man (the father of one of my student who shall remain nameless) who is one of the most charismatic people ever. Now in his 40s-50s, he obviously grew up during a much different era. During communism, jobs were chosen for you. Your field of education was chosen for you. Essentially, your entire life was laid out for you, without any input from you. This man currently owns a paper shop in Shkoder where he sells pens, notebooks, etc. and makes photocopies. Nonetheless he is one of the best stand-up comedians I’ve ever heard and most talented performers I’ve seen in Albania. He can host an event, act and recite poetry like you’ve never seen. In a different country, in a different time, he would be on tv or the radio and making a killing. Now don’t get me wrong, he has a great life here in Shkoder with a wonderful family and a job that provides a comfortable living. But I still can’t help but think of what could have been if things were different back then. The whole aspect of a planned economy really did number on the spirit of entrepreneurship and go-getting in Albania. Unfortunately, the education system in Albania is still reminiscent of those times and many of my students still face the same struggles (partly because their parents grew up during these hard times and still haven’t changed their mentality). It’s heartbreaking to see students who are so talented in, for example, politics tell me they want to become pharmacists. And students who would be great journalists decide to become economists. Why is it that every student in Albania wants to become one of three jobs, regardless of their real interests or talents? On one hand I want to push them to follow their dreams and break the mold. But if I do that, they’ll be disappointing their families and setting themselves up for a life of hardship. So am I really helping by pushing them to be more “American” in their entrepreneurship? I’m not so sure. Yet somehow I can’t help it. In Albania, all seniors in high school have to take an exam called the “matura”. Okay it’s more like a set of exams, but you get the picture. And these exams basically determine their entire lives. Students with high scores on these tests (together with their high school grades…half of which have been paid for through extensive corruption that I can’t even get in to right now) will be accepted into the best programs. Imagine the pressure of the SAT but times 1000. In the US if you don’t do well on the SAT there are plenty of other schools out there besides Harvard that will take you and prepare you for a great career. Not in Albania. Here, there’s just the University of Tirana (that’s the capital). If you don’t get in there, you can pay 10 times more to go to a private university that isn’t accredited and probably has a bad reputation of students paying for degrees and never stepping foot in the classroom. Or you can go to a smaller local university (Shkdoer has one, so does Saranda), but they are far less prestigious if you want to get a good job later on. What really gets me though is that in Albania, it’s not like the US where you apply to university and then decide you major later on. These students have to apply for the exact major they will have while still in high school. When they are 18 they have to apply directly to a program at a specific school and only the top few students will be selected. If you don’t get in, they take you second choice, then your third, then your fourth, etc. So in the end someone else still decides what the rest of your life will be without any say on your behalf. You put Architecture as your preference? Well that’s full, but you can study English. Oh you don’t know English? Well you better learn if you want to get a college degree because that’s what you’re getting. And every year only a handful are chosen to study medicine (which is the most coveted degree here). Those lucky few will go on to become millionaires. The next best thing is pharmacy, then law and economy. Anything else and you are setting for a life of mediocrity. At least that’s how it seems to me, as an outsider looking in. These kids spend their whole lives dreaming of being accepted to study medicine at the University of Tirana. Everything comes down to this moment and the happiness of their parents and success of their lives depends upon it. Talk about pressure. So in the end, the question “what do you want to be when you grow up” is pretty much a moot point. It’s not like they have a choice. And if they did, they’ve never even considered what a different future could be like. Going from a planned society to a struggling illiberal democracy is a hard trajectory to follow. Especially when you don’t trust the government or the where the future of your country will be in the next 10 years. You do what you’ve been expected to do since the day you were born and you don’t ask questions. And that’s one of the hardest things for a PCV life myself to face. Albania can be a real-life Catch 22 sometimes. So to all my senior students out there, keep on keeping on. Someday one of you will become the Minister of Education and make a change in the system so that the children of Albania can dream of what they want to be when they can grow up. And more importantly, they can make that dream a reality. 2014 has arrived. Just 5 more months and my PCV service will be done. But I can’t even begin to think about that right now, so I’m just going to focus on life in Albania one more time. 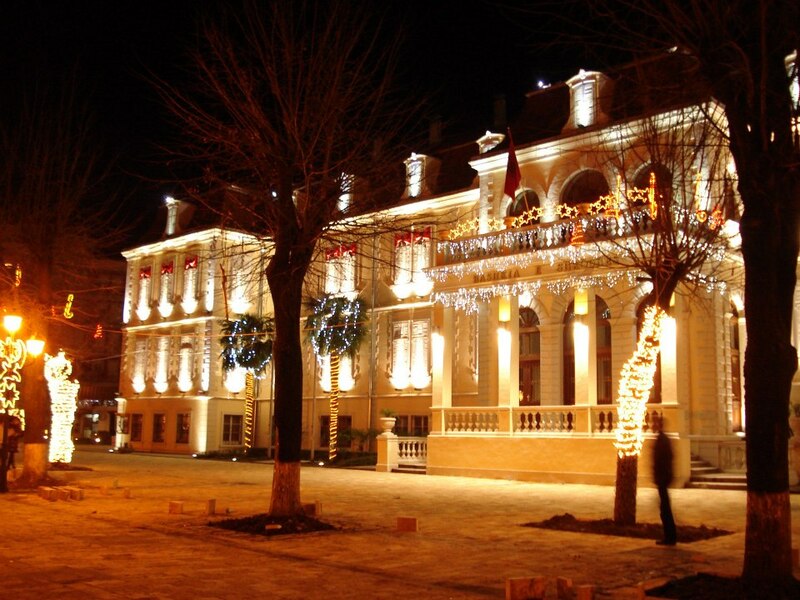 The holiday season in Albania is a tough time for an American who is used to blasting Christmas carols, putting up gaudy light shows, and drinking eggnog until my heart’s content. Those things just aren’t easy to do in Albania. Granted, in the 2 short years I’ve been here there have been some immense changes happening around me. 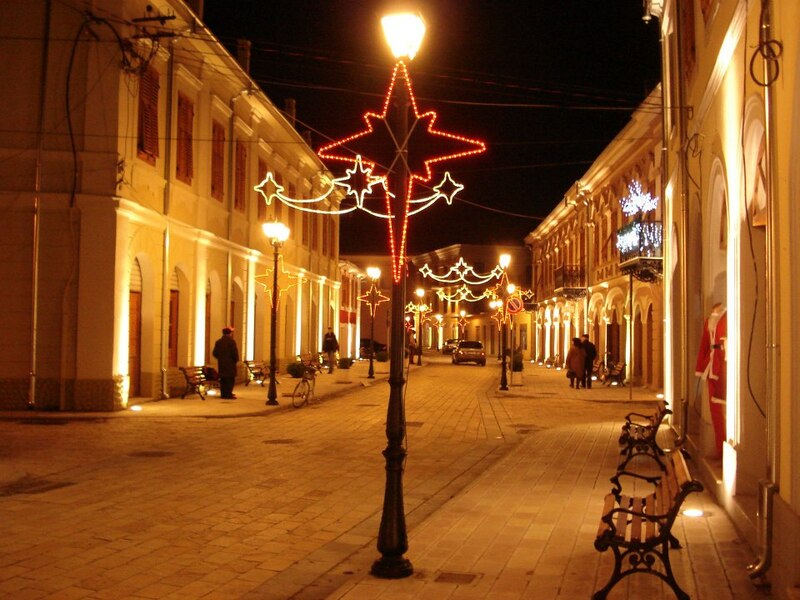 Awesome lights go up in December and the streets of Shkoder are filled with wreathes and pine trees. At first I was so excited to see all these displays and all my students in Santa hats as Christmas was approaching. 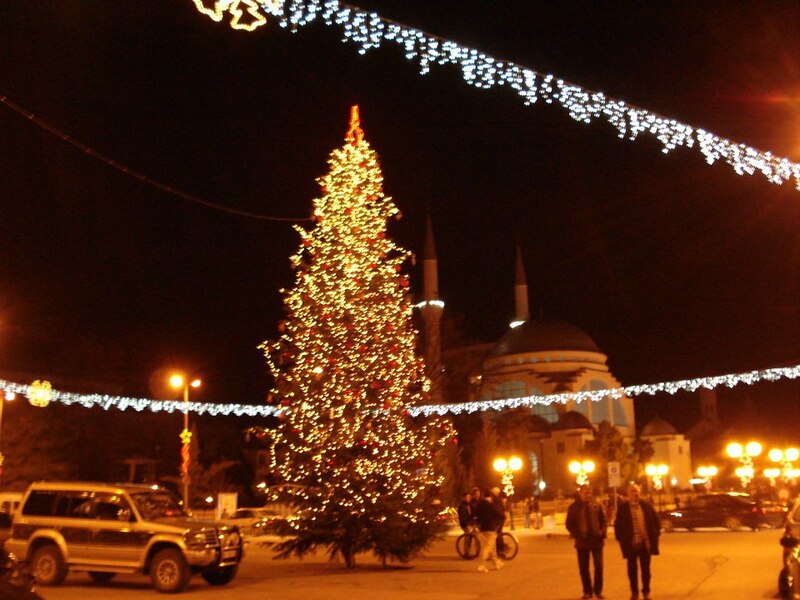 How incredibly strange for predominantly Muslim country to have such bursting Christmas spirit? I ignorantly thought to myself. But then I took a close look and actually read the captions on the tv and the words printing on the Santa hats. Gezuar Vitin i Ri! That translates to Happy New Year. That’s right, in Albania pine trees are put up and decorated in every house as a symbol of the new year and Santa hats are worn on the 31st, not the 25th. They completely absorbed another holiday and made it their own in order to fit in with the rest of the world while maintaining their own Muslim identity. After all, I don’t think Santa Claus delivered presents in the Bible and I’m pretty sure there is no mention of a pine tree filled with lights there either. No harm no foul in my opinion. I’m sure all my Fox News lovers will have a different opinion. But for me, it’s just one more reason why I love living in Albania. After 50 years of religious suppression during the communist dictatorship, people here are pretty open and welcoming of every faith. They don’t question or pester or get all defensive about saying “Happy Holidays” versus “Merry Christmas.” In fact, every single person wished me a “Merry Christmas”- Orthodox, Muslim, and Catholic alike. Albania is such a cool place because in the same town, on the same street you can find a communist building, a mosque, a Christmas tree, and an Orthodox church. Despite the homogeneity, it’s quick a beautiful mixture of religions and people that coexist in peace. A lesson to be learned by everyone. The concert hall at the Sydney Opera House holds 2,700 people. This blog was viewed about 39,000 times in 2013. If it were a concert at Sydney Opera House, it would take about 14 sold-out performances for that many people to see it. Smoking in Albania is a little out of control. I don’t think this is something unique or special about this country, but it’s definitely something that affects me on a daily basis. Believe me, when I lived in Madrid it was just as bad, but bare with me while I relate this awesome story of cigarettes, classrooms, and women power. It’s gets good eventually, just wait for it. Okay, so during the summer I must have somehow forgotten or ignored the high quantity of cigarette smokers in Shkoder. Probably because I spent the whole day outside where the smoke doesn’t stagnate and soak into my lungs, hair, and every fiber of my clothes. But during the winter, all the bars and restaurants close their outdoor seating and I’m forced to remain indoors to thaw out my fingers while sipping on my macchiato. And because it’s so cold outside, most places keep their windows shut tight and don’t let fresh air in or smoky air out. All in all, this makes for a pretty abrasive coffee drinking experience for an American who is used to people having to stand 100 yards away from the entrance of a building or public space before lighting up their cigarette. I never realized how much I appreciate that law or the public shaming of smokers until I came to a society that does the exact opposite. In fact, there is a “no smoking inside” law in Albania, but like most laws here it is not enforced in the slightest. Which makes for some pretty ironic, head-shaking moments as you enter a bar covered in no-smoking signs that are barely visible for the smog of cigarette smoke billowing around them. So anyway, I started writing this post about smoking because the greatest moment happened at school the other day. We have this makeshift teacher’s lounge where everyone gathers in between classes to regroup and gossip. Now this might shock you as much as it did me when I first started teaching here, but smoking in schools is not exactly rare or frowned upon. Teachers walk up and down the hallways with lit cigarettes in their hand on a regular basis. And all too often the teacher’s lounge is full of people quickly getting their nicotine fix in between lessons. Even though I find it outrageous that in a place of education where people are supposed to be enriching their brains, we are filling their lungs with toxins, I’ve never said anything. I just try to sit by a window and hope that after 2 years of second-hand smoke I don’t go back to America with lung cancer. Unfortunately, the dangers of cigarettes and second-hand smoke are not very well known to Albanians and many people chalk it up to superstitions not medical facts when I say smoking will kill them. The whole room immediately got silent. All the teachers stopped talking, turned and looked at her with terror in their eyes, fearing what the vice principal was going to say to her in return. He immediately started screaming in Albanian and I only caught pieces of what he said, but it wasn’t nice. She didn’t back down though. She refused to show him where she had hidden the ashtray and insisted that he stop smoking in the teacher’s lounge. I couldn’t help but smile awkwardly as she said (on her own accord without my prompting) everything I’d been thinking for the last year and half. And then it got even better. Much to my surprise, another female teacher quickly chimed in and came to her rescue. “That’s right! No smoking! We don’t want the smoke in here!” And for the remainder of the 5 minute break, I sat there with my eyes wide open and my jaw on the floor as these teachers unleashed on the vice director and shamed him for smoking in the teacher’s room. It was a beautiful thing to witness. When the bell finally rang he huffed and puffed and stormed out with the unlit cigarette dangling from his fingers. Granted, I don’t think he got the message because his response to their onslaught was “Well you guys wear so much perfume that I can’t breathe so you can breathe this smoke!” First of all, what?! How is that a comeback? Second of all, perfume doesn’t kill you. But whatever, totally beside the point. Ironically I’ve given up on wearing perfume in Albania because the stench of cigarette smoke has seeped into every item of clothes and every strand of my hair that it’s just not worth it. But I’ll kindly kept that opinion to myself. Anyway, until the ashtray magically reappears it looks like he’ll be keeping his smoking to his private office and away from the rest of us. I’m so proud to work with such forward thinking and strong women who can stand up for their rights. They are the reason I love my job and think this country has a bright future ahead of it. If you’ve been following along with my posts for the last year you’ll understand how intense it is for a woman to stand up to a man, let alone a man who is a director and a solid 30 years older in a position of authority. So it looks like I’ll be breathing easily for the last 5 months of my service in Shkoder. Bravo ladies, bravo. Cheating must be an American concept. That’s the only explanation I can give as to why it’s so difficult to explain to my Albanian students why it’s not okay to copy and paste directly from Wikipedia and turn it in as your homework. Or why it’s not okay to give your friend the answers to a test while I’m standing right there. In the beginning of my time in Shkoder, cheating was more of a shock than a frustration. Reaally?! You’re going to copy off his paper right in front of me?? And smile when I give you my best “stop it right now, I’m a teacher, please respect me” look?! Okay, I see how it’s going to be. Bring it on. But now it’s reached the point of shear befuddlement. I’m aghast and speechless every time, probably because over the last year I’ve become so invested in these kids and this community. It’s so hard to believe when I see it and hear because these people are like my family, and no one wants to think badly of their family. So instead of assuming my students are just bad kids and Albania is full of criminals and people who deserve the life they have, I decided to dial my anger back. Time to try and read between the lines and understand why cheating seems to be perfectly acceptable in the Balkans. Like everything else in this region, I think it has a lot to do with its communist past. Recently I asked one student how he did on an exam and he told me, “Well, we helped each other on the test so we could both do better”. I kind of cocked my head to the side and said, “So you cheated?” in utter disbelief. “No! We just helped each other.” And I repeated, “So you cheated. That’s cheating.” But for every time I claimed he’d cheated, he just repeated that it wasn’t cheating to help a friend when they don’t know the answer. Where is this coming from?! It’s like trying to convince someone the sky is blue when they’ve been told their whole life that that color is purple. It’s just not going to work. During communism, people had to work together and teach each other. Every thing was communal and people shared just to survive because it was the only way. You depended on the kindness of neighbors and friends to make it thought. And it became expected that if you new the answer and your friend didn’t that you’d help him. It was just the right thing to do. You had to look out for each other after all. And this mentality of helping your friends and “hospitality” spread to what most of the western world considers blatant cheating. This explains a little bit why when someone is reading out loud in class the whole class shouts and corrects him every time he makes a mistake. And if I ask someone a question who doesn’t know the answer, the kid next to him will whisper the answer in his ear in a very obvious fashion. I can only ignore it for so long. When students stand up and read entries straight off of Wikipedia for their homework assignment or turn in an essay that is copied straight from the web (highlighted links and all), it’s pretty hard to turn your back. These kids want to study at universities in America and all over Europe. They’re going to need to figure out how to keep their eyes on their own papers and site sources at some point. I might as well start teaching them now. But how do you demonstrate the importance of doing your own work when those around them who never study and cheat get better grades? There’s no punishment for cheating in Albania and most teachers either participate, encourage it, or turn their back when they see it. And I seem like the crazy one who is shocked when the best kids in class do it. Maybe it’s a Balkan thing, maybe it’s a communism thing, or maybe it’s an Albanian thing. But hopefully in the next few months I’ll be able to hit the message home. It’s heartbreaking to hear an incredibly talented and smart kid admit to cheating. Especially when it’s on a test as important and world-renowned as the SAT or TOEFL. But then I remember most of these tests are not accredited to be taken in Albanian and understand why. I think Albania has a bright future and I think my students will be the ones to take it there. I only hope they learn how to think for themselves and do it honestly before it’s too late. Wish me luck!